Lanre Gentry, the estranged husband of Nigerian actress, Mercy Aigbe, has disclosed that the Nollywood star has been suffering from psychological problem for long. He said this in a chat with BONonline where he discussed the recent crisis rocking his marriage. Lanre said contrary to the reports making the rounds that he turned the actress into a punching bag, it was Mercy that ganged up with her friends in her designer, Luminee House, to attack him. He claimed that while the others beat him, his wife hit him hard with a stool. 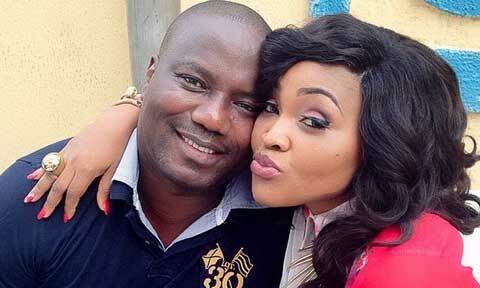 Lanre denied that he has ever beaten Mercy, despite the fact that he caught her several times with different men. He cited an example of last year when she said that she was going to China for 2 weeks but instead, went to a hotel in Dubai with a man. He added, “When I confronted my wife, she said she only wanted to collect money from him – a married woman!!! But I discovered that it was the same man that paid for the Magodo house she recently moved to.